Christmas is fast approaching! Please enjoy a few holiday hairstyle ideas from "Christmas past." 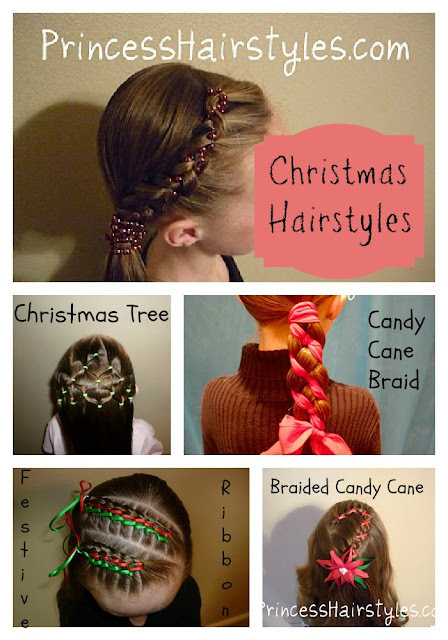 These hairstyles would be cute for upcoming Christmas parties and the like. It's fun for me to browse through our older posts sometimes. It's crazy how much our Princess has grown up and how much our blog has changed over the years! We also recently posted a tutorial for an elegant updo (shown below) if you are wanting more of a formal look. If you have not seen this one yet, the video tutorial can be found at the following link: Holiday updo. We want to wish you all a very Merry Christmas (or any other holiday you may celebrate) and hope you enjoy this season with your family and friends! im a great fan of ur hairstyles ,, is there any other side for watching ur videos except Youtube ???????? ?